Hokkaido Maruha Bar - Best Donburi! Home/Travel Japan/Hokkaido Maruha Bar – Best Donburi! 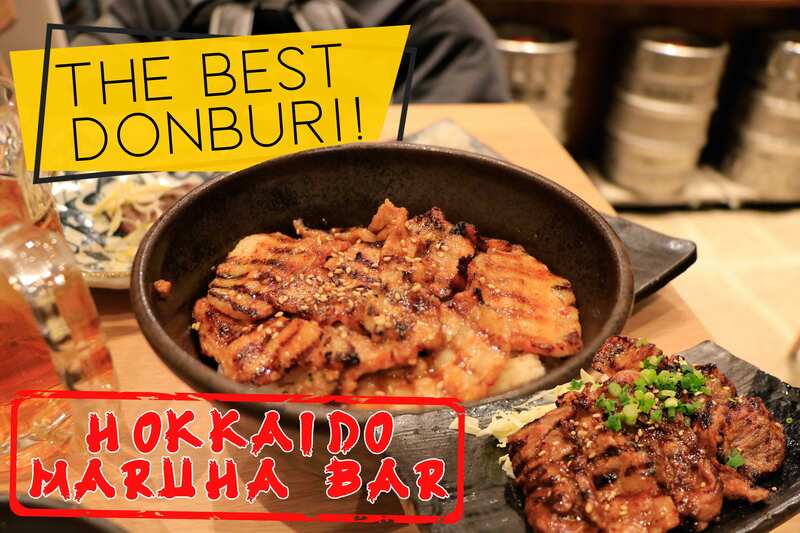 Hokkaido Maruha Bar – Best Donburi! Hokkaido Maruha Bar is a shop originally from Sapporo, Hokkaido that is known for their award winning Mochi Buta Karubi Donburi bowl (カルビ丼) . 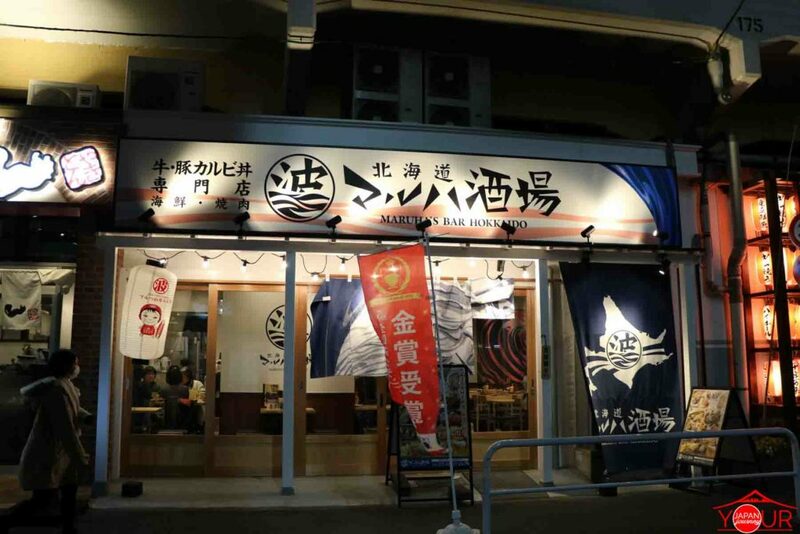 Opening their branch in Ueno-Okachimachi on 2012, they began to serve their specialty donburi bowls to Tokyo’s community with the finest quality ingredients straight from Hokkaido! First what is a Karubi Donburi bowl? Donburi (-don) means “rice bowl dish” and Karubi is a type of marbled boneless beef or pork short rib which is a famous type of meat in Japan. Karubi meat can be cooked in different ways; it can be quickly grilled braised or slow cooked to make the chewy meat tender. For Hokkaido Maruha Bar’s Karubi Donburi bowl, the Karubi meat is quickly grilled making the meat tender and smoky sweet in taste. In 2014 Shitamachi Donburi Grand Prix 2014 contest was held and Hokkaido Maruha Bar’s famous Mochi Buta Karubidon (Pork Karubi Donburi) won the first prize award! 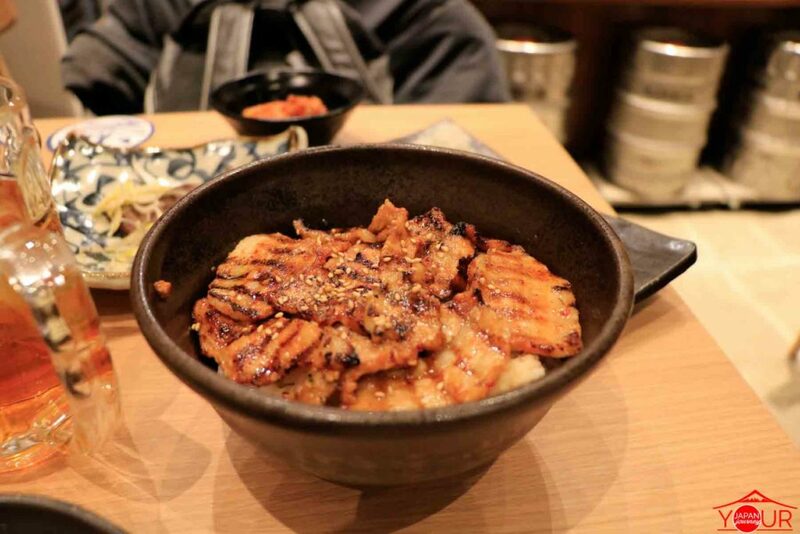 The award-winning pork rice bowl is only 680 yen, served with kimchi and miso soup. Delicious and worth the price. This meal should be on your list of food to try in Japan. 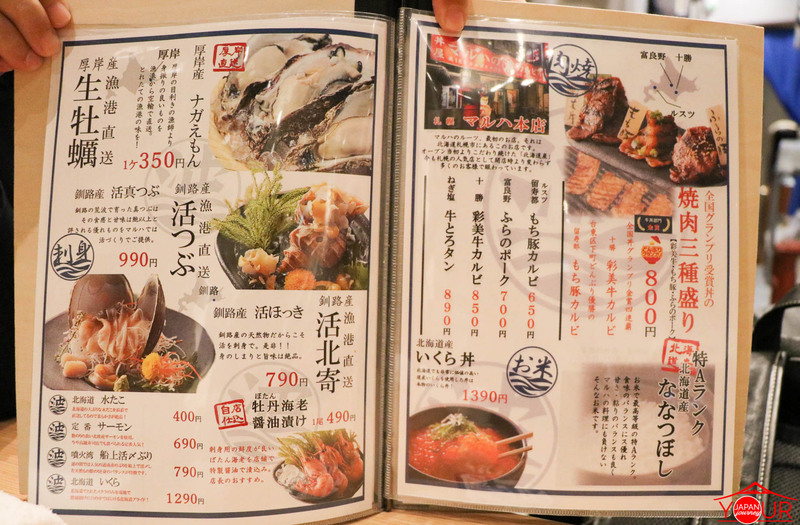 Their menu also offers different kinds of Sashimi, a wide range of seafood dishes where in the sea foods are delivered straight from Hokkaido. Isn’t it great that you can taste the finest quality of food produce from Hokkaido without the need to travel to Hokkaido? 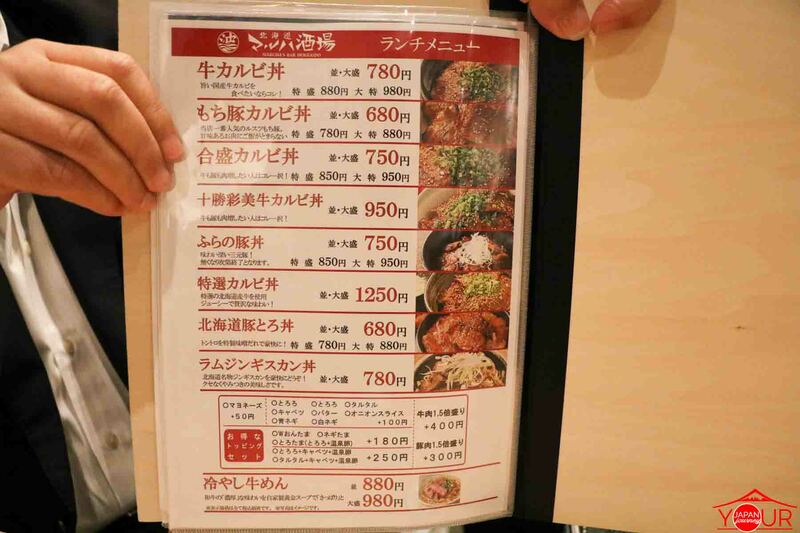 We also tried other food items on their menu, we tried their Special Beef Karubi (特選牛カルビ) that cost around 950 yen. The meat is very soft, sweet in flavor and served with shredded cabbage on the side. 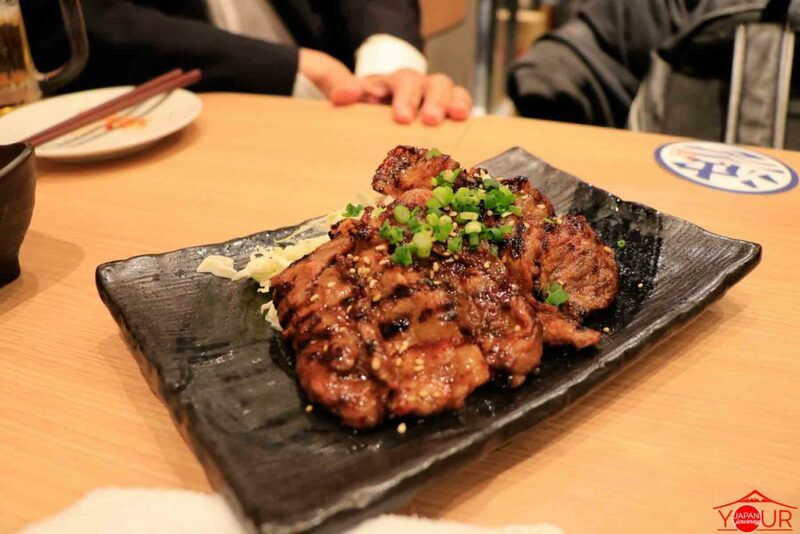 Next on the list Grilled Beef Tongue with green onion (ネギ塩牛タン)! Yep, most restaurants here in Japan serve beef tongue on their menu. It can also be cooked in different dishes, the most common is Yakiniku style or grilled. 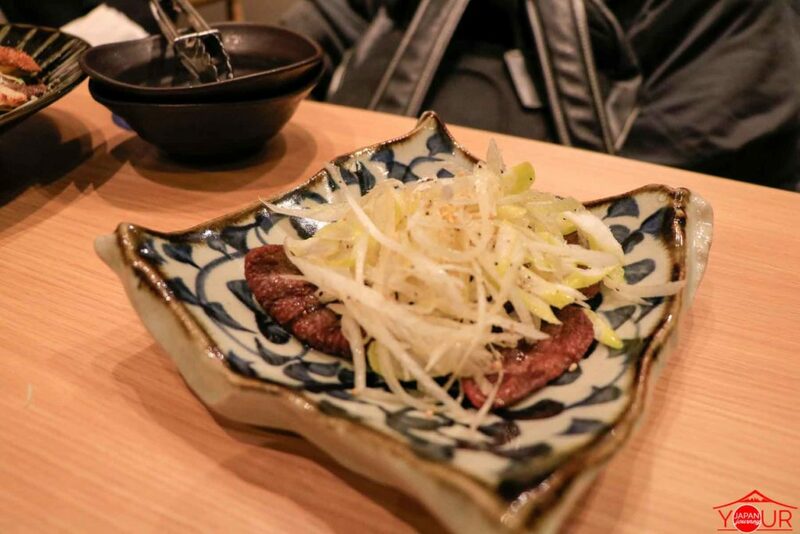 While it might be a little bizarre for most Western tourists, beef tongue dishes are very common in Japan! We recommend that you give it a try! 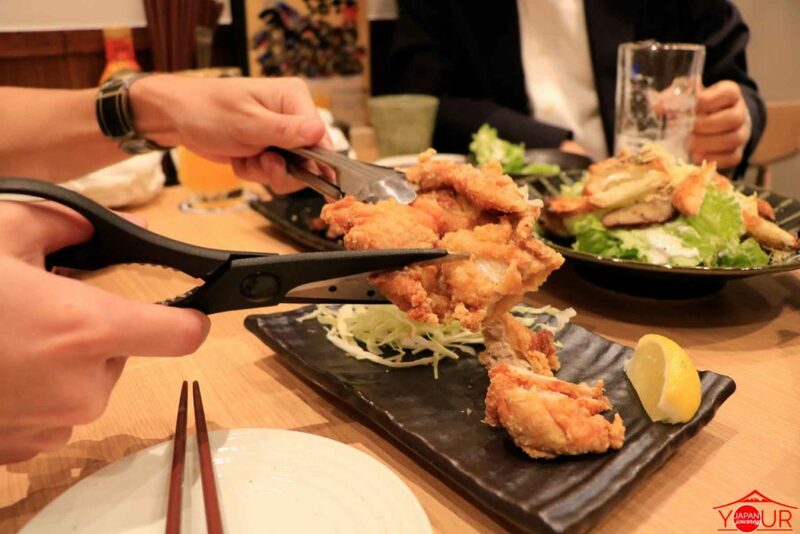 The famous Japanese Karaage is also a must try! Very crispy on the outside and soft and tender on the inside, best paired with cold beer. 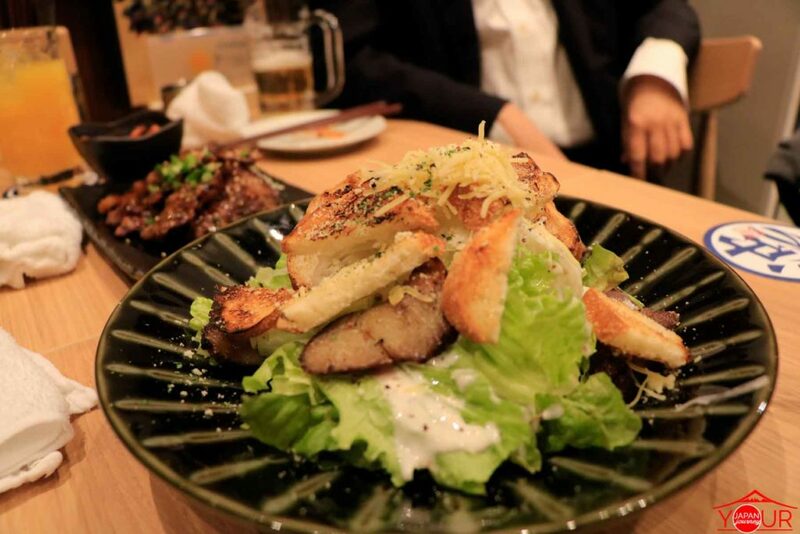 To balance out the the meat servings, Hokkaido Maruha Bar also serves salads and Japan’s famous Tamagoyaki! 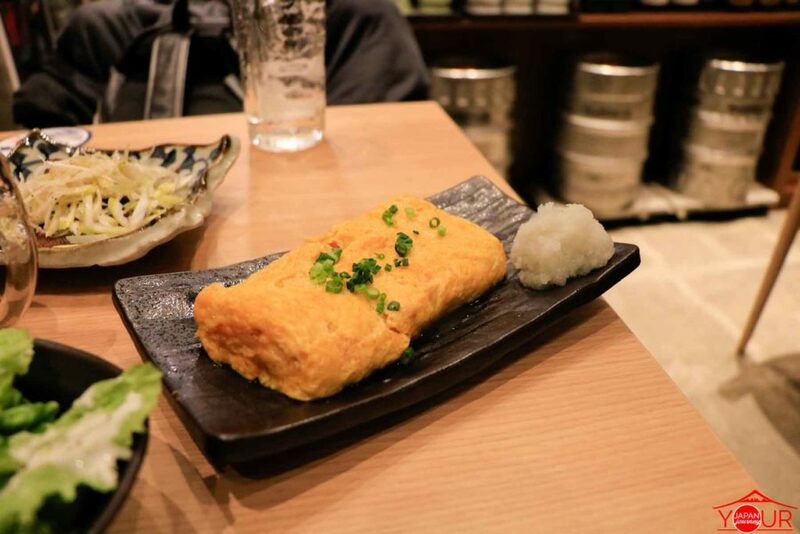 While most tourists eat the Tamagoyaki straight up, the Japanese’s traditional way of eating the Tamagoyaki is to put a little drop of soy-sauce and a bit of grated white radish that is usually served on the side. Hokkaido Maruha Bar serves Hokkaido’s seasonal food at dinner time and transforms the place into an Izakaya kind of store. 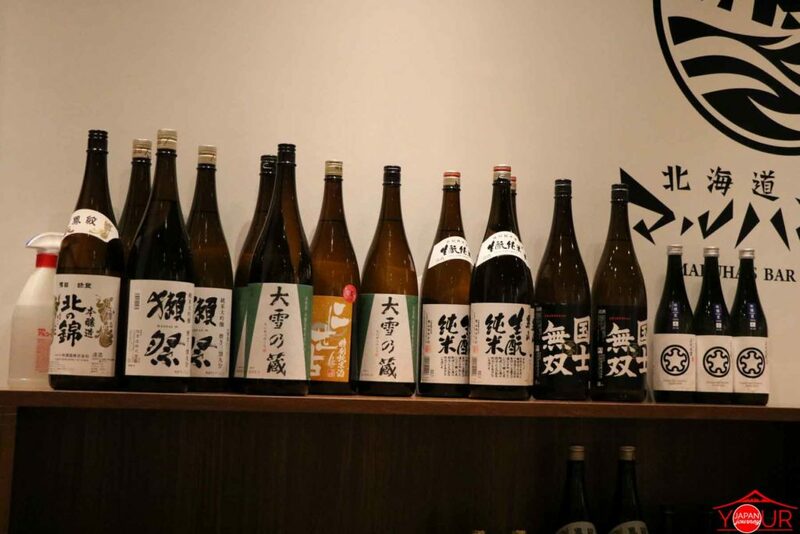 They serve a wide variety of Japanese traditional Sake best paired with the finest and fresh sashimi from Hokkaido! 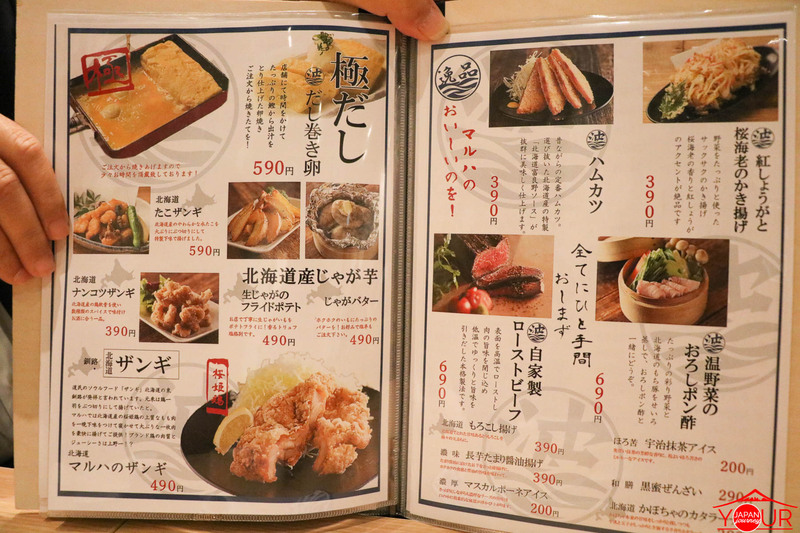 Here is a preview of their menu, although it is written in Japanese this shows the price range of their meals. We enjoyed our dinner at Hokkaido Maruha Bar, the food is very delicious with the finest quality ingredients from Hokkaido. The food items are priced reasonably and very affordable. I think if its your first time in Japan and want to try the best donburi and yakiniku, you should visit Hokkaido Maruha. All in all we rated it with 5 stars! We are definitely coming back here! 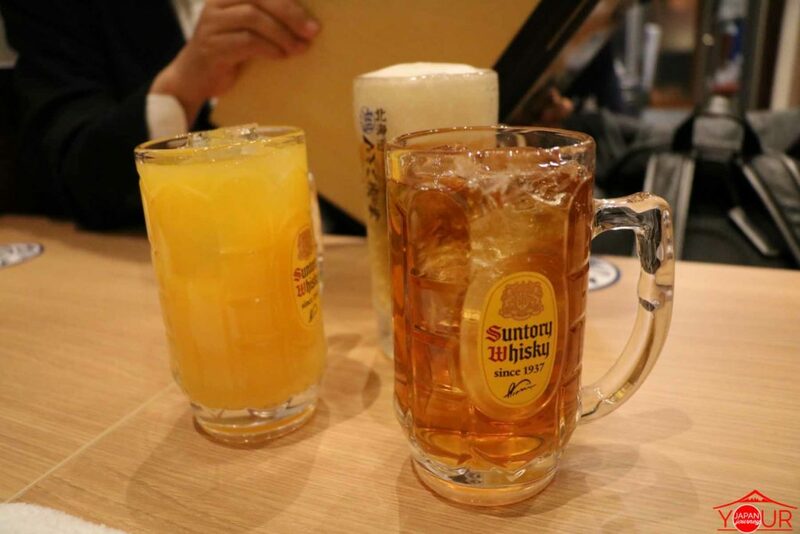 *Karubi Donburi bowl specialty at noon and on evenings they offer pub menu with seasonal food meals from Hokkaido.